This belt in theory is a great idea, but they dropped the ball a bit on design and execution. I like that the belt and buckle are interchangeable, but that is where the problem lies. Everyday before I go to put the belt on I have to unlatch the buckle, line the belt back up, and lock it down. As you can see from the first attached photo it's stripping away the leather and one day the belt is going to pop off and my pants will drop. This is from normal wear and tear after having the belt for about a month and has since gotten worse after this picture was taken last week. I'm really hoping they see this as can hopefully rectify the situation or else this was a waste of money. UPDATE: After roughly 6 months of normal wear and tear the leather grips were completely worn out (see second picture) to the point that it wouldn't hold for more than 15 minutes before coming undone. Also the buckle (black) is very prone to dings and scratches which makes it look really bad. I reached out to their Customer Service team via their Online Chat feature and was instructed to email them my order info and some pictures of the damage. Without hesitation they offered to send me a replacement and even modify it slightly by sending me the Steel buckle at my request as I feel that would be less prone to scratching (and if it does it won't show as easily). Hopefully this new one lasts longer, but as for Customer Service goes, they get an A+ in my book. I really like the functionality but the quality of the belt didn't hold up for me. I have purchased one in the past that had much better leather. 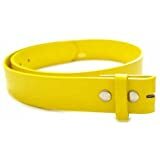 The second time I opted for a wider belt for daily wear. But within a year it started to crack and split on the inside. For the price, it should at least function for several years of use. I cannot recommend it due to the poor quality. My last purchase was in 2014 so I can't speak to any improvements that may have been made since then. I don't expect to buy another one. 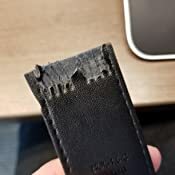 Update: I sent an email with photos of the problem to "support@missionbelt.com" and they responded quickly and favorably to my request for free replacement leather. The fact that they live up to their "100% satisfaction" statement says a lot, so I'm glad to share this information and up my satisfaction rating. I really do like the belt functionality so hopefully the replacement will be of better quality. 1.0 out of 5 starsLove the Belt...Hate the Quality! 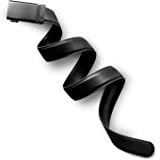 The idea of this ratchet type belt makes a lot of sense, and the belt looks good and seems to be well-made. 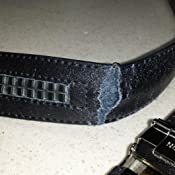 If this belt is leather, like they say it is, it must be so thin that it eventually breaks down, cracking, tearing, splitting, and generally falls apart in multiple locations both on the outer side of the belt, as well as on the inner side of the belt. 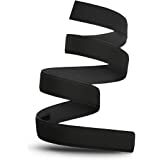 I have purchased 3 belts like this thus far, and while I like the concept, I don't like the poor construction. 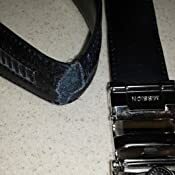 The buckle is also pitted and it cannot seem to be cleaned. 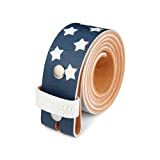 I gave this a one-star because Mission Belt needs to know that there is a serious problem with the construction and quality of their belts, and they need to do something about it! See for yourself...I have included several photos. One photo shows the pitted buckle. Another photo points out the fact that "yeah it's leather," as if that means it's higher quality or something, but right at that spot, the "leather" has split! The leather has worn off in some places, making it look cheap an inferior. In several places, the belt has just split open with a giant crack. And it's falling apart where the gear rack is located on the underside of the belt. I like the belt. I've worn it most days for a few weeks and it seems like it will wear well. If it doesn't, I'll update my review. The belt has a nice feel to it - I think it is two full leather straps with something else in the middle for support, and the buckle works really nicely to give a comfortable fit. At 1-1/2", mission belts seem to be the widest of this type of belt out there, and while that is narrower than I prefer for a casual belt, that width can work for casual and formal settings. Competitors are even narrower - too narrow for casual wear. I tried 2 competitor belts - slidebelt and fire kiln (or something similar to that). 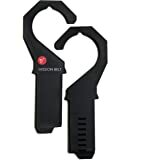 The slidebelt is a ratchet system where you pull open on the actual buckle instead of a little tab just below the buckle. The slidebelt Buckle system seems "cooler" - it's sleeker, but I think that feeling is mainly in my head, as no one sees the little tab on the mission belt. Visually and as far as how well they work, it is probably the same. The slidebelt ratchet is held closed with a spring, while the mission belt uses a magnet. Maybe the mission belt system is sturdier, but both buckles will probably last a long time. 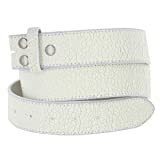 The mission belts are offered in two widths, which was the difference-maker for me -ultimately, I returned the slidebelt because it was just too narrow for casual wear. 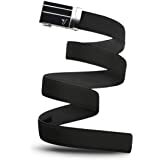 The slidebelt comes in 3 varieties of leather. I got the lowest quality of slidebelt leather, which made the price within a few dollars of the mission belt. 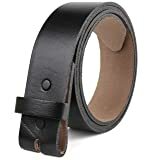 The leather quality of this slidebelt and the mission belt seemed the same - not a high quality leather, but sufficient. one of my 2 mission belt buckles is matte black, as was the slidebelt buckle I tested. Both looked really nice. 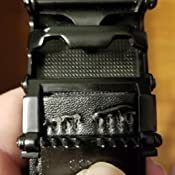 The fire kiln brand I tried uses the same type of buckle as the mission belt and my initial reaction was that the buckle was the the same, but the belt was such a terrible, bendy plastic that I didn't really focus on the buckle. The strap was also too narrow (like the slidebelt). I gave that belt a poor review based solely on the strap, but when the company wrote me to explain that based on complaints, they revised their description so it no longer refers to the strap as being leather, I redid my review. 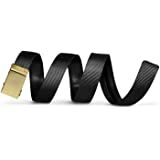 If you don't care about the strap being leather and want a narrow belt, this brand may be more attractive since the buckle seems on par with mission, but the full belt is less money. if you're looking for a shade of brown, mission belt has more shades Than slidebelt. 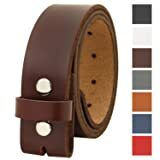 I had trouble finding the right one because the belts look different in the various, available pictures, so here's my tip for you with browns - based on my experience with the mocha, chocolate, and dark brown straps, the photos mission provides of the guy wearing the belt most accurately shows the color; the photos of the belt by itself are not as accurate for judging what the color will look like in real life. I bought the black with the iron buckle and the dark brown with a "swat black" buckle, which is more of a matte black. the buckles are interchangeable and I'm really happy with my choices. The look of the iron buckle is really cool for a casual look and is not nearly as rough as it looks in the photo. If there was a "formal to casual" scale where a shiny silver buckle is a "1" - most formal, and the buckle in the picture is a "10," then I'd say the real iron buckle is a Is definitely "casual only" but it looks really nice. It probably would be similar with the bronze buckle. The swat black can be used for either, formal or casual, so if you really want a single buckle that can work in all situations, swat black is probably the way to go. With both of these, the mission belt logo is either not visible or not noticeable. The black and dark brown belts look good with both buckles. I did not like the mocha or chocolate with the iron buckle, but they looked nice with the swat black. Mission belt customer service was nice and responsive. I Did experience "quality Control" problems. With the iron buckle had to order the belt 3 times to get a good buckle. The first 2 had weird discoloration on them. Customer service was helpful and would have sent a replacement, but it was faster to rebuy and return through Amazon. What I learned that both "problem" buckles were made in the single facility that stocks the Amazon warehouse in Hillsborough County, FL. 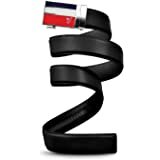 The 3rd time I ordered the belt, I worked it to get one from a different facility. 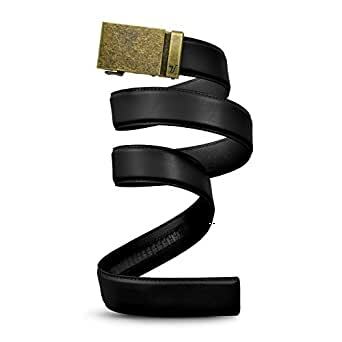 When I ordered a brown belt with swat blswat strap, I received a white belt with swat buckle one time and a cloth blue strap with a matte silver buckle another time. Fwiw, the silver buckle seemed nice, and could also work in casual and formal situations, but I do not think the cloth belt would be comfortable - it's a nice nylon (I think) material on the outside with a layer of plastic on the inside that I think would cause sweating and discomfort, but maybe it needs to be that way to support the ratchet system. If I were going to go with a nonleather casual belt, I'd probably take a closer look at Grip6. Overall, I like the width of the mission strap better than others I've seen and mission is like the quality of the leather as much or more than other ratchet belts I tried although it is definitely a lower quality leather than the regular belts I am used to. 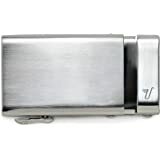 I expect the belt and buckle to wear well; I really like the look of the iron And swat black buckles; and customer service was very responsive and helpful.